Check out today's prep team spotlight on the East Jefferson Warriors as they get ready to take on the Lakeshore Titans tomorrow! Check out today's prep team spotlight on the Assumption Mustangs! In today's prep team outlook, we caught up with the defending Class 5A state champion Zachary Broncos! Football is finally here! To help you get started for the season, we have unveiled our 2nd All-South Louisiana Offensive and Defensive Team. 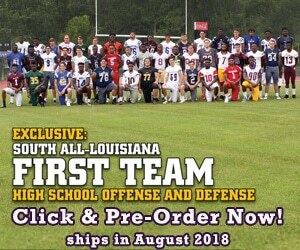 To find out who made the team, click here, and to find out who made our 1st All-South Louisiana Offensive and Defensive team, make sure to buy our 2018 South Magazine edition! Check out today's prep team outlook on the Catholic High Bears as they start their title defense this week! Check out today's prep team outlook on the South Plaquemine Hurricanes! Check out today's prep team outlook on the Denham Springs Yellow Jackets, which is a team trending upward after Head Coach Bill Conides' first season coaching the team!